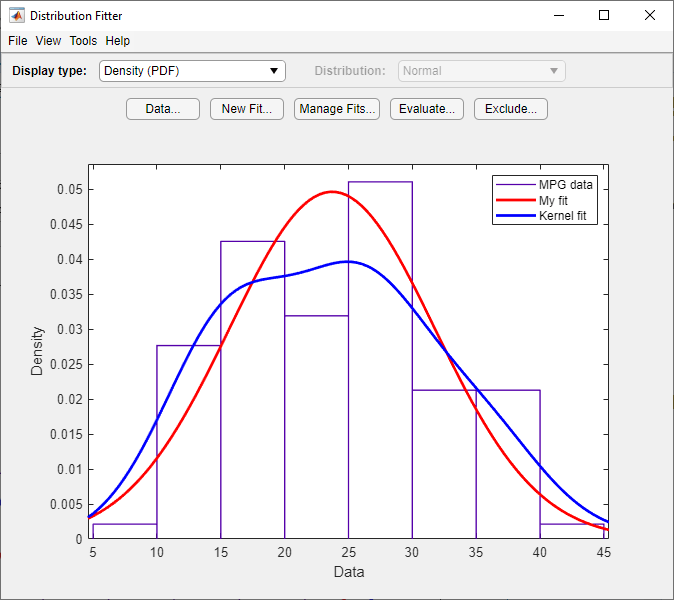 This example shows how you can use the Distribution Fitter app to interactively fit a probability distribution to data. Open the Distribution Fitter tool. To import the vector MPG into the Distribution Fitter app, click the Data button. The Data dialog box opens. 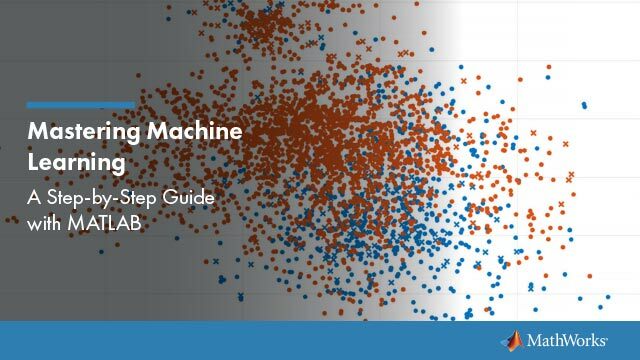 The Data field displays all numeric arrays in the MATLAB® workspace. From the drop-down list, select MPG. A histogram of the selected data appears in the Data preview pane. 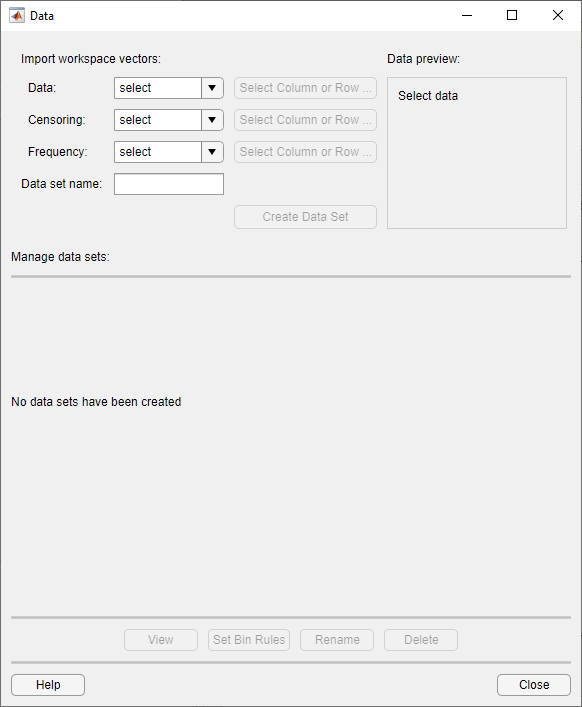 In the Data set name field, type a name for the data set, such as MPG data, and click Create Data Set. 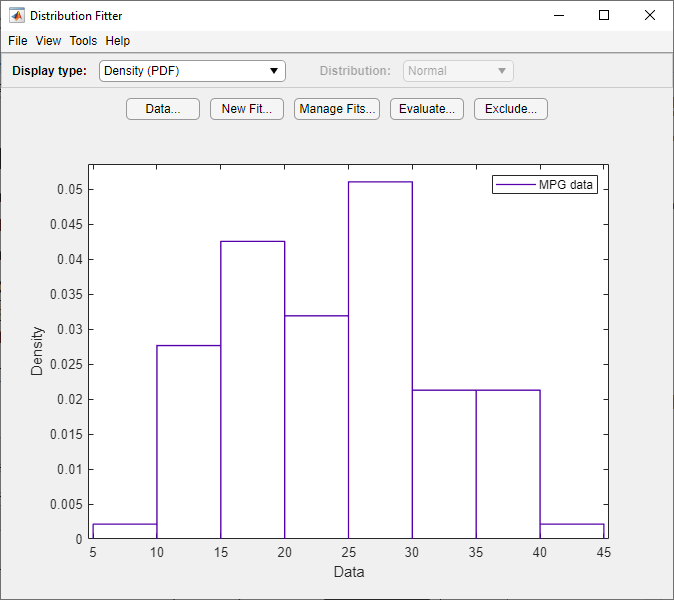 The main window of the Distribution Fitter app now displays a larger version of the histogram in the Data preview pane. To fit a distribution to the data, in the main window of the Distribution Fitter app, click New Fit. In the Fit name field, enter a name for the fit, such as My fit. From the drop-down list in the Data field, select MPG data. Confirm that Normal is selected from the drop-down menu in the Distribution field. The Results pane displays the mean and standard deviation of the normal distribution that best fits MPG data. 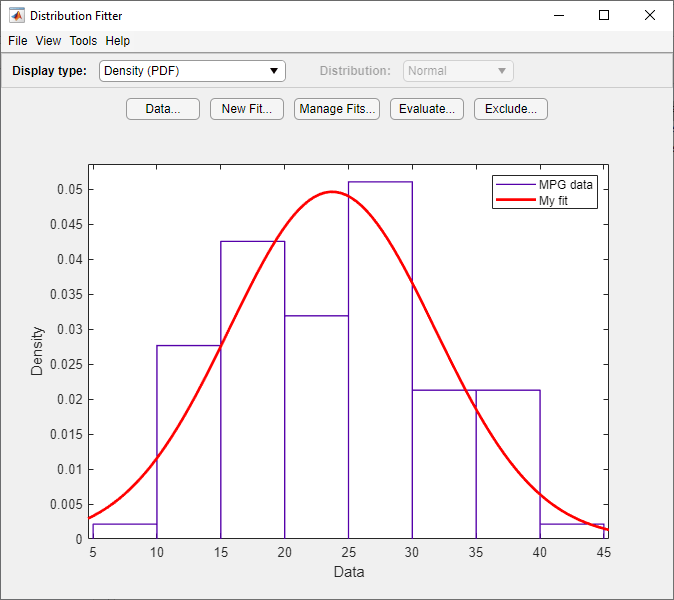 The Distribution Fitter app main window displays a plot of the normal distribution with this mean and standard deviation. Based on the plot, a normal distribution does not appear to provide a good fit for the MPG data. 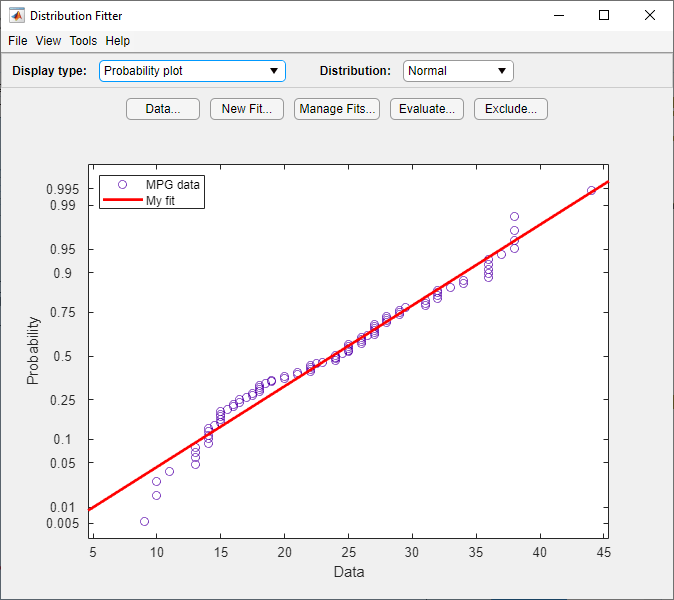 To obtain a better evaluation, select Probability plot from the Display type drop-down list. Confirm that the Distribution drop-down list is set to Normal. The main window displays the following figure. The normal probability plot shows that the data deviates from normal, especially in the tails. The MPG data pdf indicates that the data has two peaks. Try fitting a nonparametric kernel distribution to obtain a better fit for this data. Click Manage Fits. In the dialog box, click New Fit. In the Fit name field, enter a name for the fit, such as Kernel fit. 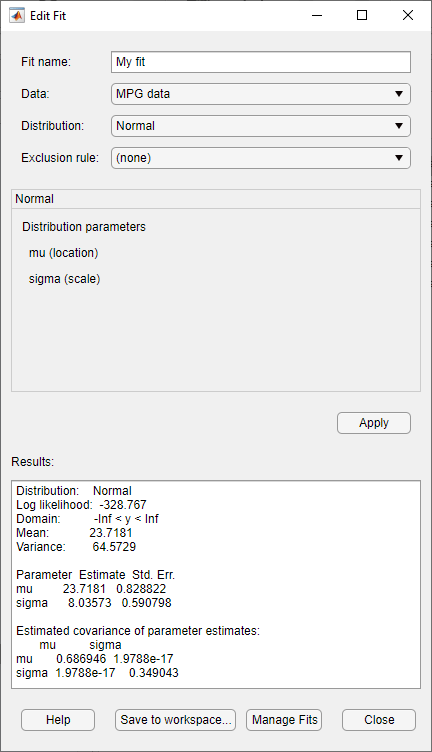 From the drop-down list in the Distribution field, select Non-parametric. This enables several options in the Non-parametric pane, including Kernel, Bandwidth, and Domain. For now, accept the default value to apply a normal kernel shape and automatically determine the kernel bandwidth (using Auto). For more information about nonparametric kernel distributions, see Kernel Distribution. The Results pane displays the kernel type, bandwidth, and domain of the nonparametric distribution fit to MPG data. The main window displays plots of the original MPG data with the normal distribution and nonparametric kernel distribution overlayed. To visually compare these two fits, select Density (PDF) from the Display type drop-down list. 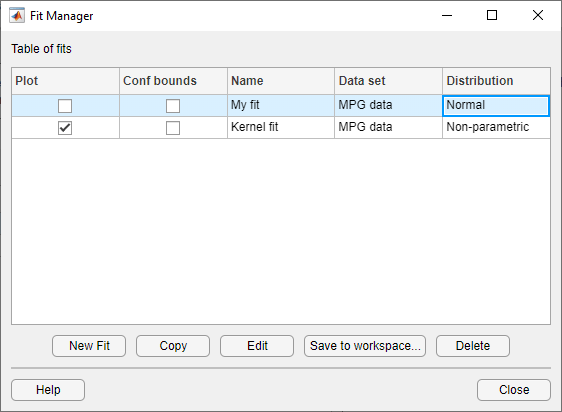 To include only the nonparametric kernel fit line (Kernel fit) on the plot, click Manage Fits. In the Table of fits pane, locate the row for the normal distribution fit (My fit) and clear the box in the Plot column.